The Washington County Career Center held its 9th Annual Fall Festivus Day on Friday, October 26. This year, Fall Festivus was held with all 15 career-technical programs participating in several fun activities. Kicking off the event, staff performed a “flash mob” dance to Michael Jackson’s Thriller song. Directly afterwards, students and staff participated in a Halloween Costume Contest sponsored by Student Council. Other activities held were a lip sync contest, vertical leap, bench press, wall squats, team skis, corn hole, tire flip, and marshmallow dodgeball. The day ended with the awarding of the “Festivus Pole” to the winning program who accumulated the most points from each event. Last year’s winning technical program, Graphic Design & Video Production, handed the pole to this year’s winner, Digital Marketing. The Festivus Pole will remain in their possession until next year when they will have to defend their title. 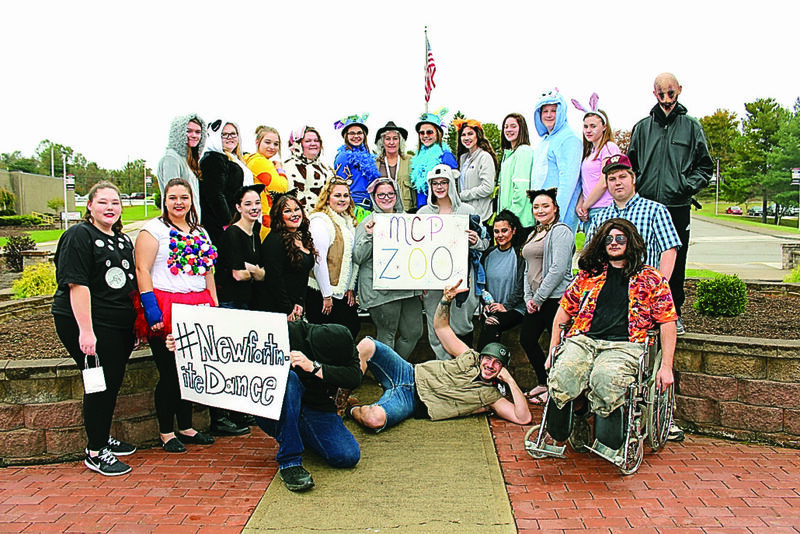 Halloween Costume Contest Winners: Most Original: Shelby Arnold and Laken McMaster as “Gumball and Money Machines”; Prettiest: Mrs. Robin Wright and the Medical College Prep students as “MCP Zoo”; Scariest: Austin Amash as “Smiley – Stitch Face”; Funniest: Jason West and Tyson Wilcoxen as “Forest Gump and Lieutenant Dan”; and Best Staff Costume (Tie): Mr. Zach Husk as a “New Fortnite Dance” and Mrs. Robin Wright as the “Zoo Keeper”.